In a very collegial and wide-ranging discussion at Linköping University with Leelo Keevallik, Asta Cekaite, Nigel Musk, Ali Reza Majlesi and Mathias Broth, I was very happy to answer queries about ROLSI’s reviewing and decision-making. The Linköping group encompassed experienced and early-career researchers, established publishers and novices, expert senior reviewers and those just starting out. We all found it a useful experience, and we got together afterwards to prepare a set of notes that we think might be of interest to the broader ROLSI readership. Q (Linköping group): Is ROLSI particularly difficult to get published in? 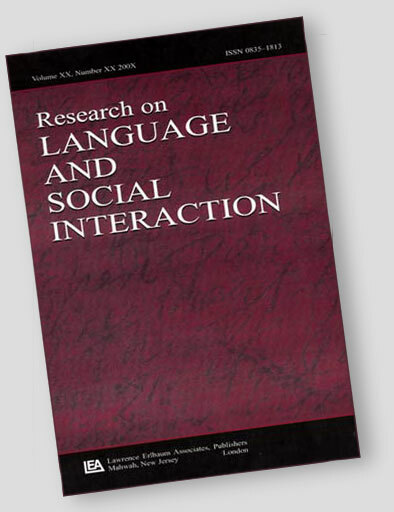 A (Charles Antaki): The rejection rate is quite high, but it’s inflated by a surprising number of submissions that get turned away simply because they don’t fit the journal, We aim to publish “the highest quality empirical and theoretical research bearing on language as it is used in interaction“(- emphasis in the original) as we say in our “Aims and Scope” . Authors who don’t register that boundary and send in things outside it – sometime way outside it – will get a polite encouragement to send their work to a place better suited to their project. So if your paper fits our bill, you stand a more than decent chance of getting it reviewed. Q: How many reviewers, and how do you pick them? A: Three, chosen by topic relevance, experience and availability. We usually try and mix very experienced and established academics with newer ones (unless the paper is especially demanding, by dint of technicality, scope or significance). I’m delighted to say that ROLSI reviewers are almost always highly conscientious, prompt and thorough; it is they who make the journal what it is. Occasionally a reviewer or two will – perfectly properly – have to decline the invitation, and sometimes life gets in the way of a reviewer submitting their comments on time; at worst, we will proceed anyway with only two reviews, so as not to make the author wait unreasonably. But they will be good reviews. Q: What does ‘revise and resubmit’ mean? A: Just that – please change the paper in the way recommended in the decision letter, and we will be pleased to look at it again. The ‘resubmit’ part doesn’t mean that everything starts from scratch; your paper will be read – sympathetically – against the original, and against the decision letter’s recommendations and the Reviewers’ comments. Q: How much work is wanted in the revision? A (very!) few submissions are accepted “with typographical amendments”. Easy: correct the glitches, tidy up the references, that sort of thing. A rare pleasure for editor and author alike. A few more are asked to “revise with minor work required”. Clarification, structural work, slimming down a section or beefing up another, acknowledging a relevant set of references – the sort of thing that could be done in a week’s work, on and off. But most submissions that get this far want either “middling” or “major” revision. The line between minor and middling is blurry – perhaps middling wants more examples, a clearer conceptualisation, the removal of a distracting sub-theme, but no major surgery. You could do it in a month between other jobs. “Major” means we think that the paper is probably saying something good and worth pursuing, but we (the Reviewers and I) are not yet convinced of it: please work hard to show us that it is. Reanalyse this aspect in the light of this more obvious reading; say why the project can be carried off at all; explain why it’s an advance on existing literature; persuade us that there really is a phenomenon under all the detail. This might mean two months’ thoughtful work; more if other duties intervene. But if I think that there would be just too much to do, I will say so, and that will be a ‘reject‘. May I say that many, many papers come close, and the word ‘reject’ is too harsh to capture the fine margins of discretion; indeed I have seen – and been pleased to see – the submission appear (often improved by the reviews) in another journal. Then I think: “good for the author – I hope they send us their next one”. Q: How likely is a revision to succeed? A: One of four things will be clear once the revision comes in. it has hit the targets so well that there is nothing to do but to celebrate with the author, and put the article straight into the production schedule. Success. the paper is clearly improved, but could still do with a comb-through, which I will do myself, and ask for a final version from the author. Provisional success. much has been done, but I need to check whether it really has satisfied all the Reviewers’ recommendations; it is sent out to at least one Reviewer: usually two, but in doubtful cases all three. Uncertain success, but there is definitely hope. Either on my inspection, or after consultation with the Reviewers, it becomes clear that the revision hasn’t dispelled the doubts that the original submission had raised; so, regretfully, a rejection (but see “reject”, above). Part 2 coming soon: what the editorial team actually does, what ROLSI publishes, and what next.